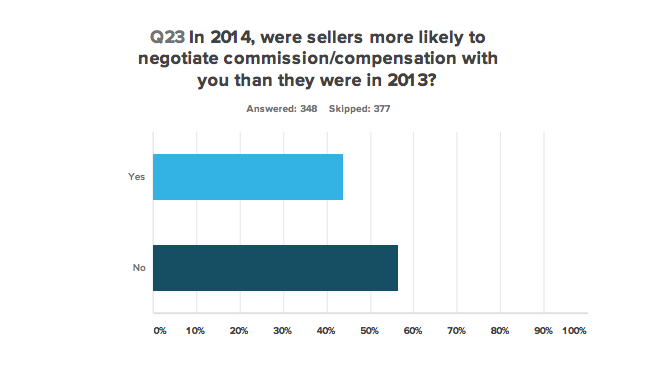 Listings may still be hard to come by in many markets, but the overwhelming majority of real estate brokers and agents surveyed by Inman say they’re not about to compete for sellers by advertising that they’ll work for less than full commission. 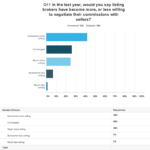 Just 14 percent of the 725 agents and brokers participating in an online poll from Oct. 8 to Nov. 7 said they compete for listings by publicizing their willingness to negotiate their commission, provide services at a reduced commission rate, or on a fee-for-services basis (click to download full report and charts as PDF file). 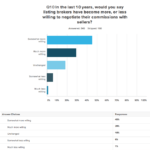 Among those who don’t compete for listings on price, only a handful (8 percent) said they already have all the business they can handle. So what’s stopping them? 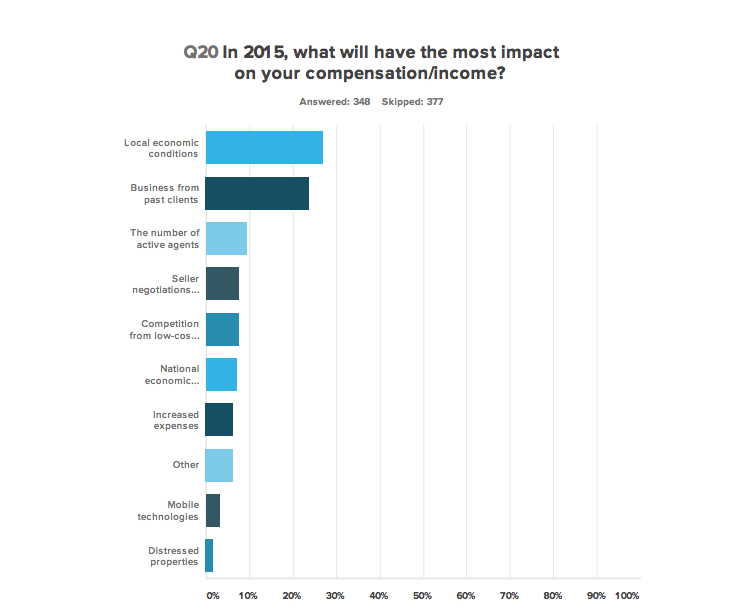 About 1 in 4 (23 percent) said their profit margins are already slim and they can’t afford to charge less. 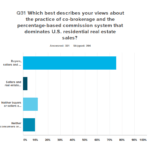 Roughly the same proportion (25 percent) said they fear that if they represent a seller at a reduced commission, other brokers might not promote their listings to their buyers. 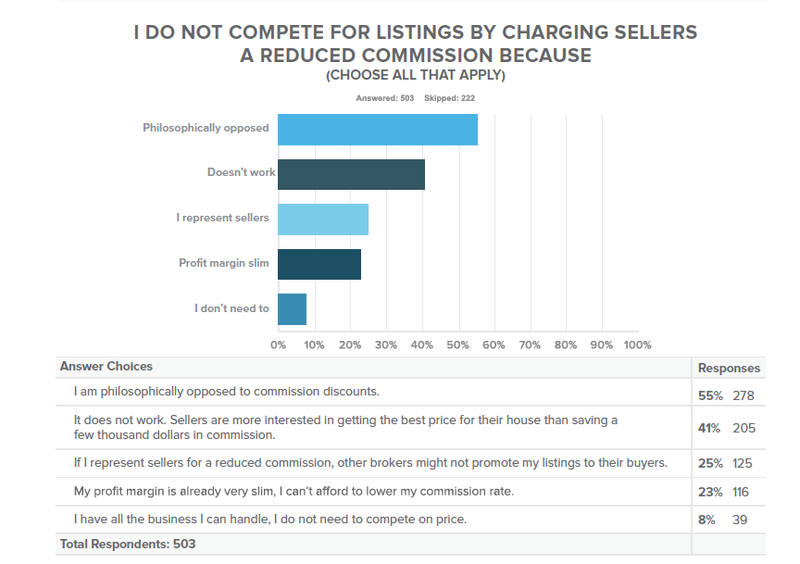 But the most often cited reasons for not competing for listings on price was that it simply doesn’t work (41 percent), and that agents and brokers are philosophically opposed to commission discounts (55 percent). 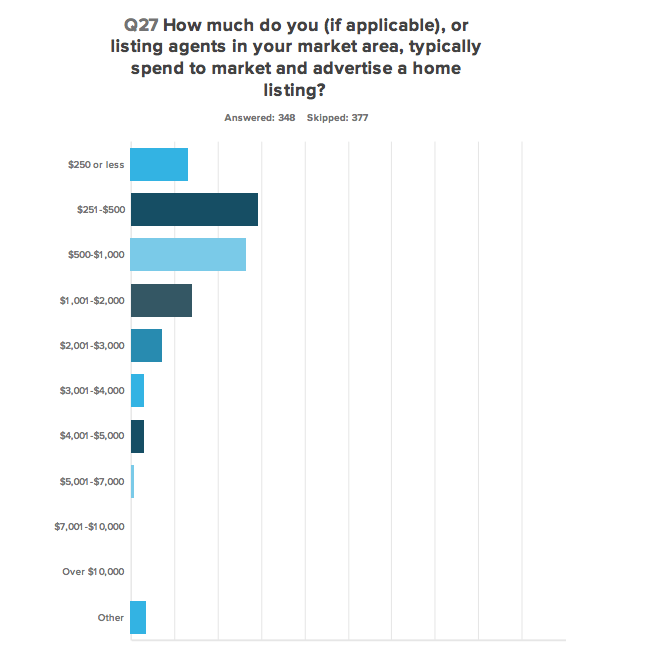 Others said competing for listings on price doesn’t work, because sellers are more interested in getting the best price for their home than saving a few thousand dollars in commission. 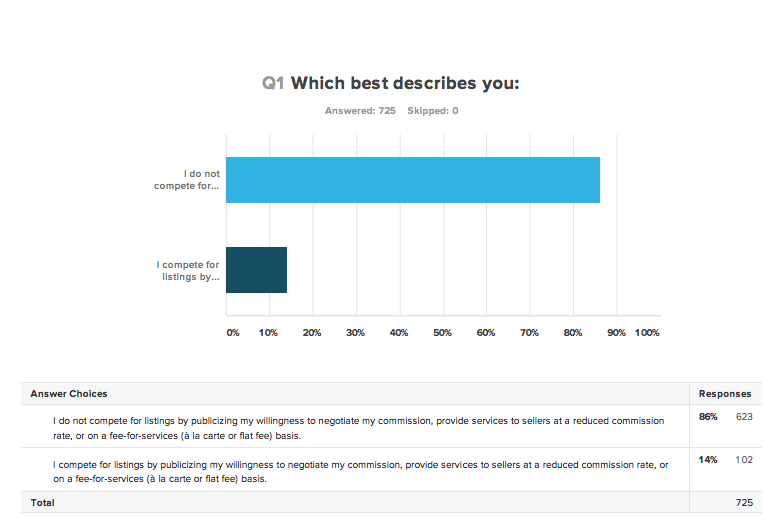 “In my market area consumers expect to pay a full commission and also expect impeccable service, I would estimate that only 10 percent of my customers ask to negotiate my commission,” said another. Others who said that although they don’t publicize their willingness to negotiate commission reductions with sellers, that doesn’t mean there aren’t situations in which they will. “Once I am in a position to win the listing and find that the commission is TRULY an issue (after answering the objection a few times), I will negotiate … if it’s a good property and the owner is realistic on price,” said one real estate professional. 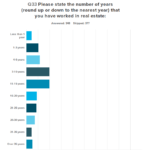 But there’s definitely a whiff of fear in the concerns expressed by some agents and brokers about working for anything less than full commission. 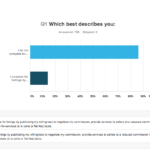 Although 86 percent of those surveyed said they themselves don’t advertise their willingness to negotiate their commission, most (54 percent) it was not unusual for brokers in their market to compete for listings by offering commission discounts, and 1 in 5 (18 percent) said it was the norm. 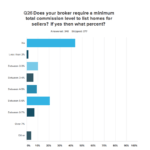 Only 21 percent said it was “somewhat unusual” for brokers in their market to offer commission discounts to sellers, and 6 percent said it was rare. 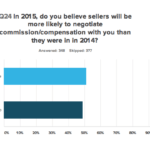 Most of those surveyed said in the last year, listing brokers have become more willing to negotiate commissions, with 29 percent saying they are much more willing to negotiate, and 45 percent saying they are somewhat more willing. “The number of agents chasing market share makes it ultracompetitive, and most agents (and) brokers do not know how to differentiate themselves from the crowd,” complained one respondent. 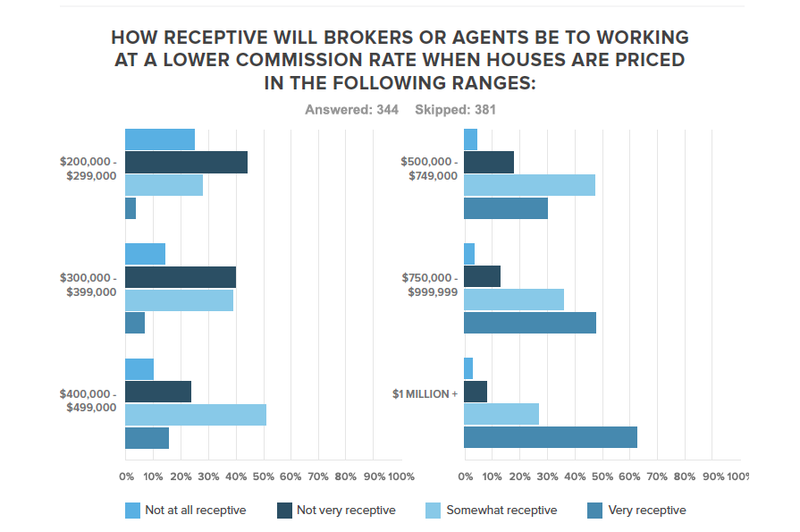 Asked how receptive listing brokers would be to working for a reduced commission rate for homes in six price ranges, most did not think sellers of homes priced at less than $400,000 would have much luck. 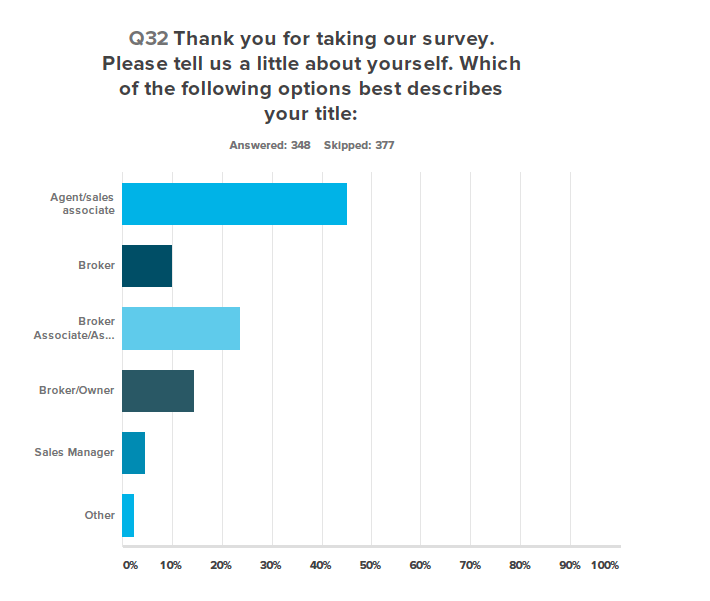 But above that range, most agents and brokers thought listing brokers would be somewhat or very receptive. 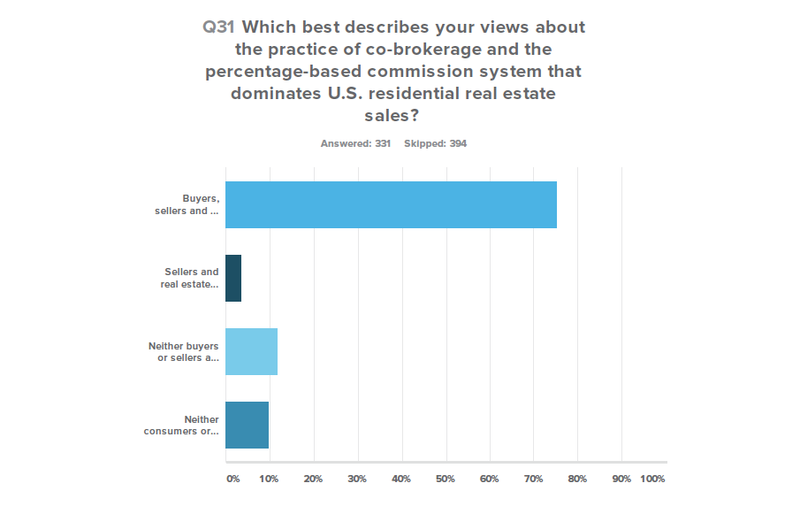 For listings priced at $1 million and up, 63 percent thought listing brokers would be very receptive to working for a reduced commission, and 27 percent said they would be somewhat receptive. 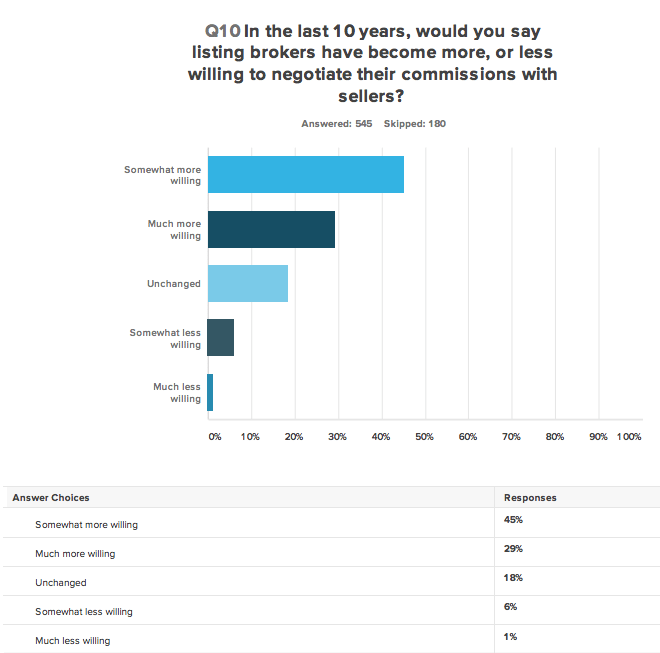 Only 3 percent said listing brokers would be not at all receptive to taking a $1 million listing for a reduced commission rate. So what represents full commission these days? 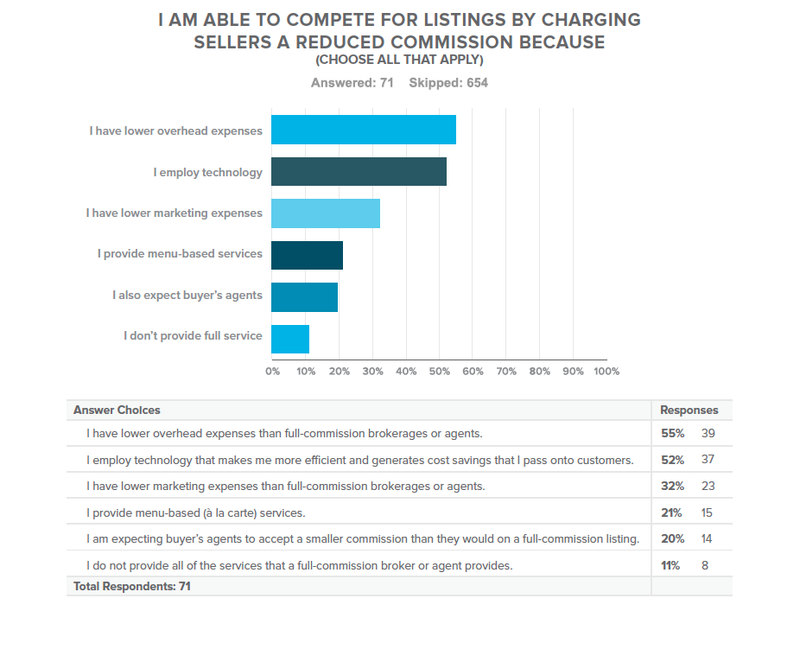 About 7 in 10 agents surveyed charge sellers a total commission of between 5 and 6.5 percent to list their home. 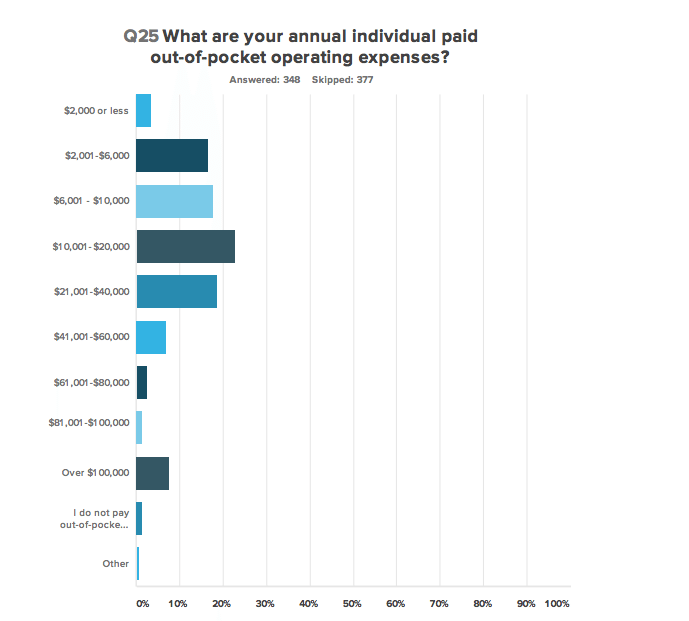 The sweet spot was 5.5 to 6 percent (37 percent of those surveyed), with 15 percent charging 6 to 6.5 percent, and the same proportions charging 5 to 5.5 percent. 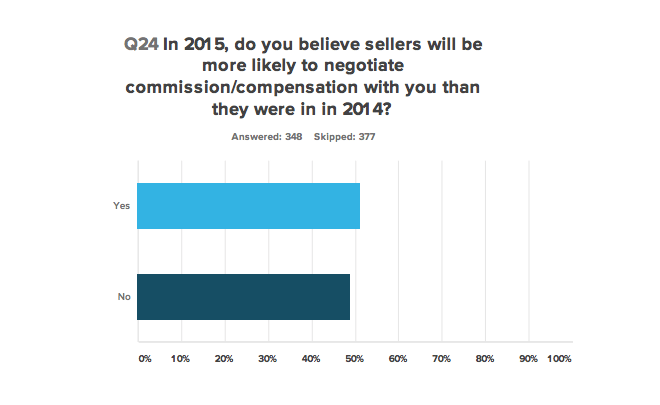 Less than 4 percent of listing brokers and agents said they charge 6.5 percent or more. The air was just as rarefied at the other end of the spectrum. 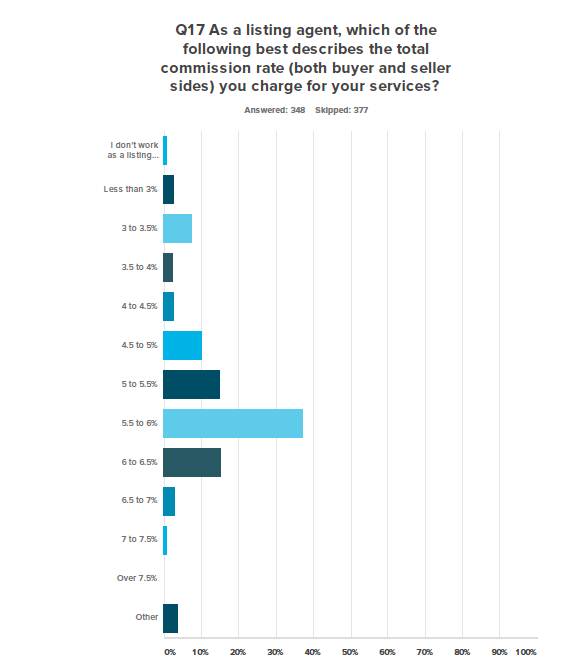 While 1 in 4 listing agents said they charged a total commission rate (both buyer and seller sides) of less than 5 percent, only 2.59 percent of those surveyed said they charged less than 3 percent. 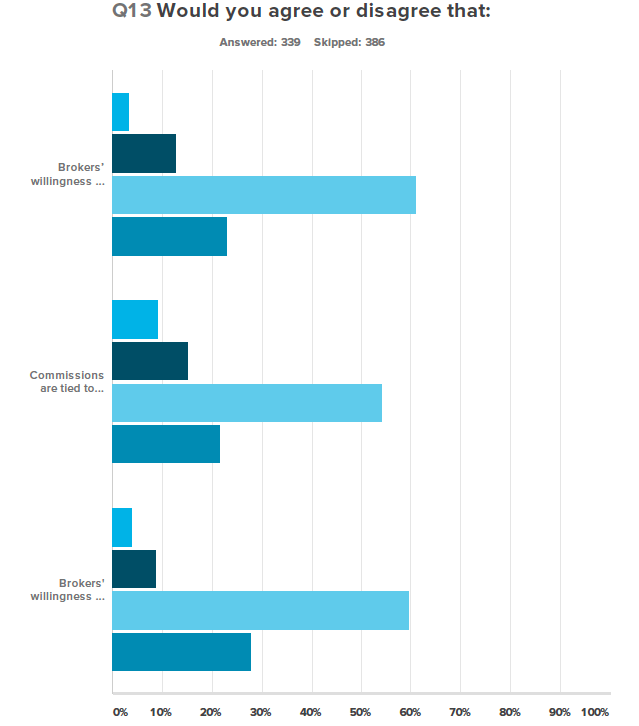 When Inman polled brokers and agents in 2011 there were more agents working the high and low end of the commission spectrum. 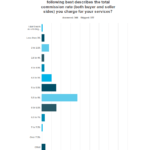 Three years ago, 26 percent of those polled said they charged less than 5 percent total commission, and 5 percent charged less than 3 percent. 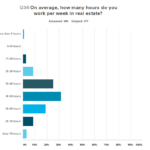 While 60 percent charged between 5 and 6.5 percent to list and sell a home, 5 percent were charging more than that. Commission rates often depend on the circumstances of the transaction, including the type of property and volume of business from the client. 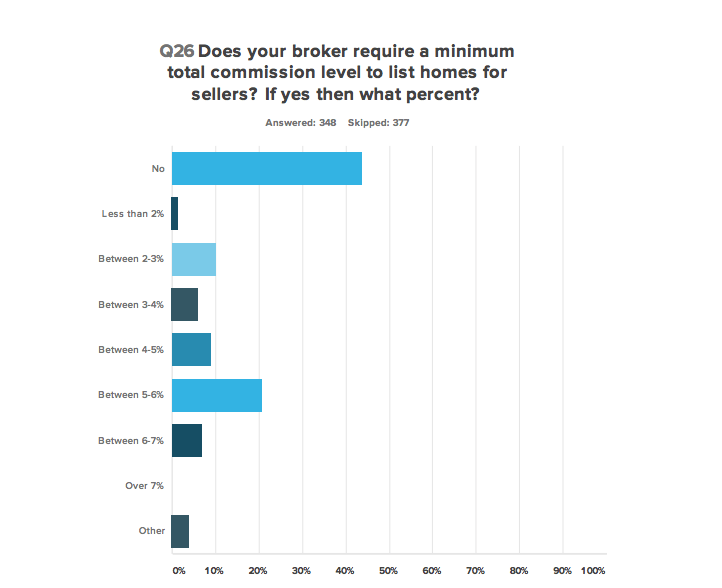 Most said their broker requires a minimum total commission level to list a home, with that minimum most often falling between 5 and 6 percent. 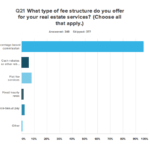 Nearly all agents and brokers surveyed (96 percent) offer to provide their services in exchange for a percentage-based commission, compared with 8 percent who offer flat-fee services. 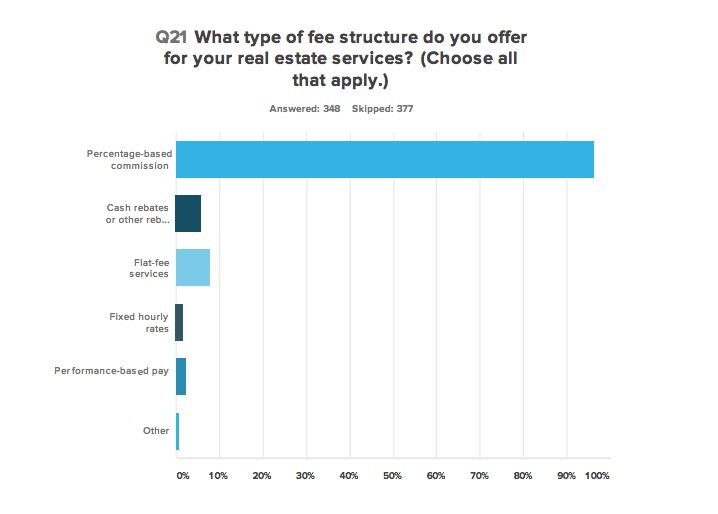 Less than 2 percent of agents and brokers said they’ll provide services to clients for a fixed hourly rate. 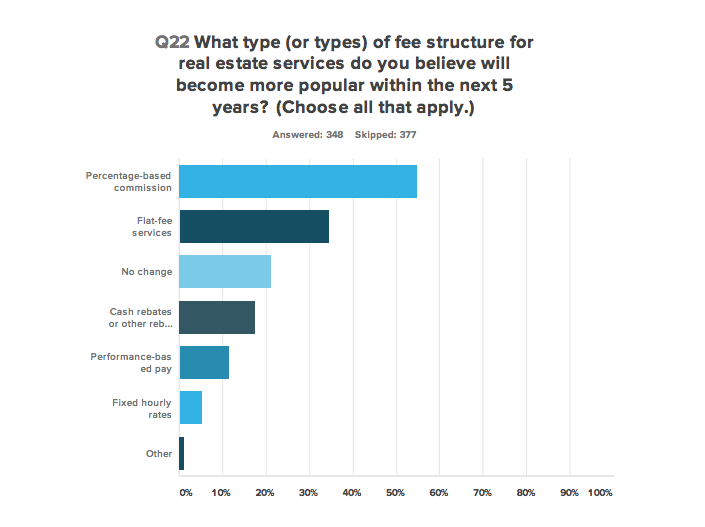 In the next five years, more than one-third of those surveyed (35 percent) said they expect flat-fee services will become more popular. While most of those surveyed said discounters were present in their market, few see them as a threat. 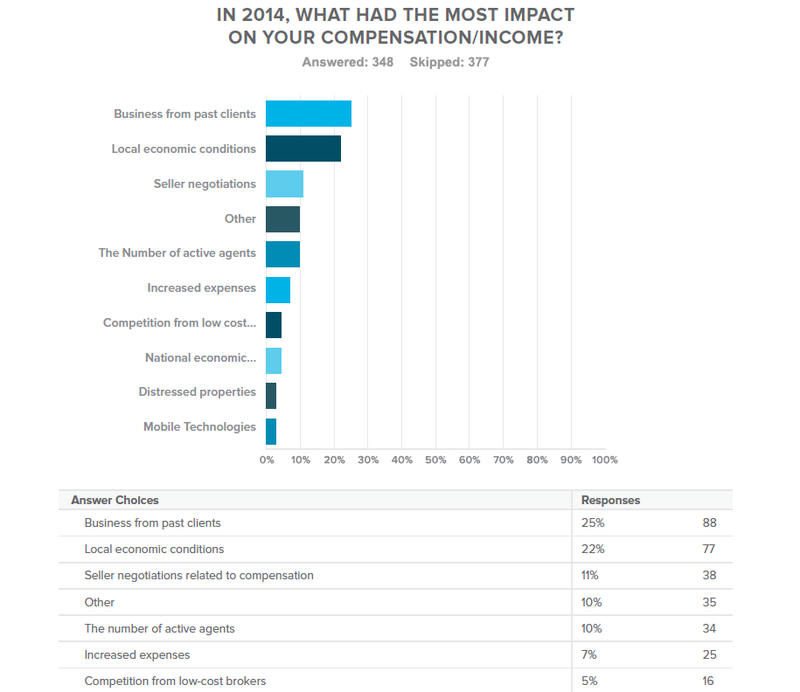 Asked what had the most impact on their compensation and income in 2014, brokers and agents were more likely to say business from past clients (25 percent) or local economic conditions (22 percent) than seller negotiations related to compensation (11 percent) or competition from low-cost brokers (4.6 percent). 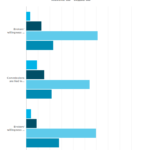 More (10 percent) saw the number of active agents as a problem. 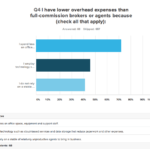 Among those who to compete for listings on price, most (55 percent) said they are able to do so because they have lower overhead expenses than full-commission brokers or agents. 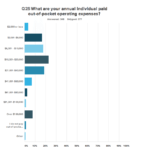 More than half (52) percent said they employ technology that makes them more efficient, generating cost savings that they can pass on to consumers. 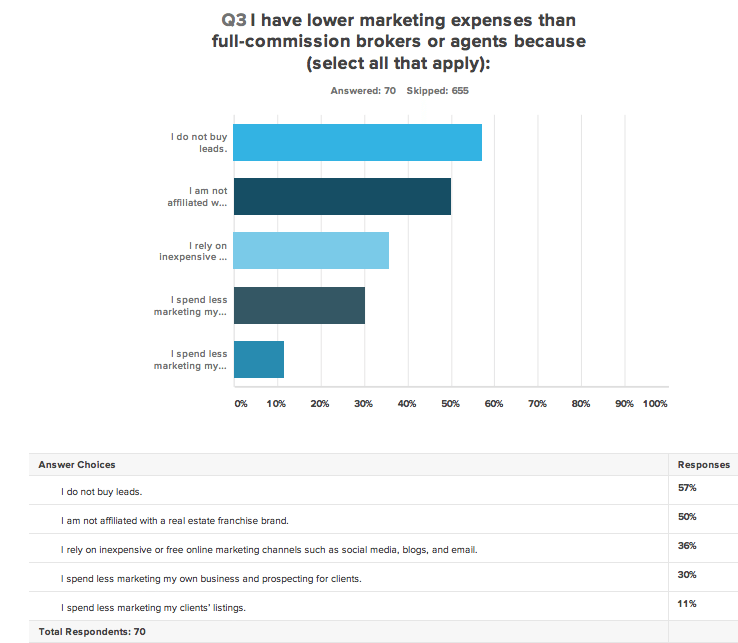 Only about 1 in 3 (32 percent) said they have lower marketing expenses than full-commission brokers or agents — which could raise doubts about claims by full-service brokers that agents and brokers who charge less than full commission skimp on marketing. 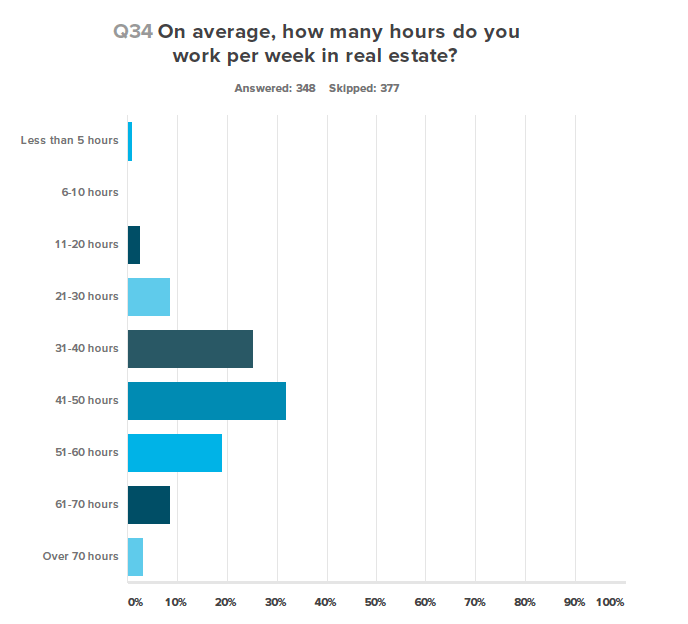 “I spend much more marketing my listings than any discount broker,” said one respondent who doesn’t believe in working for less than full commission. 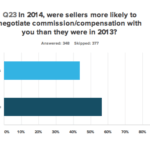 In the same vein, only 20 percent of agents who compete on price or offer menu-based services say they expect buyer’s agents to accept a smaller commission than they would on traditional, full-commission listings. 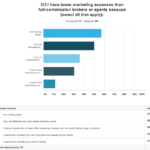 But 57 percent said one reason their expenses are lower is that they do not buy leads. 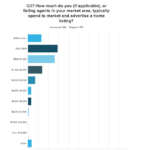 Half said they were not affiliated with a real estate brand, and 35 percent said they rely on inexpensive or free online marketing channels such as social media, blogs and email. 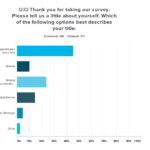 Close to a third (30 percent) said they do spend less marketing their own business and prospecting for clients than full-service brokerages. 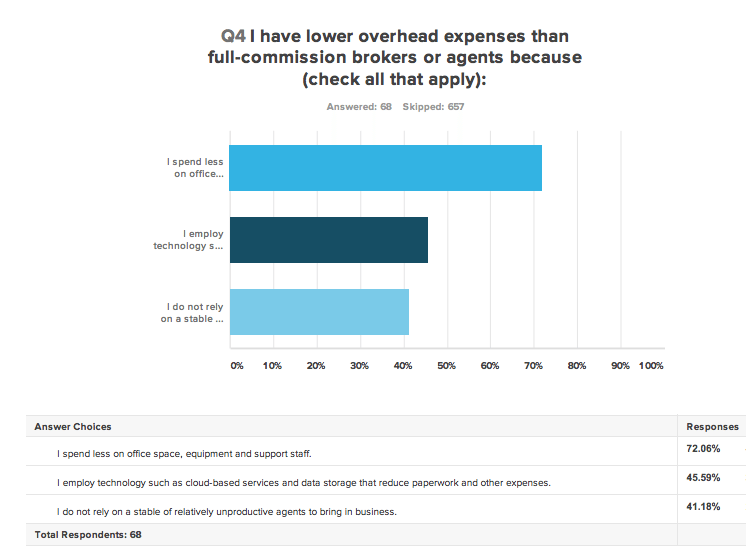 Nearly 3 in 4 (72 percent) of brokers and agents who compete for listings on price said they spend less on office space, equipment and support staff, and 41 percent said they do not rely on a stable of relatively unproductive agents to bring in business. 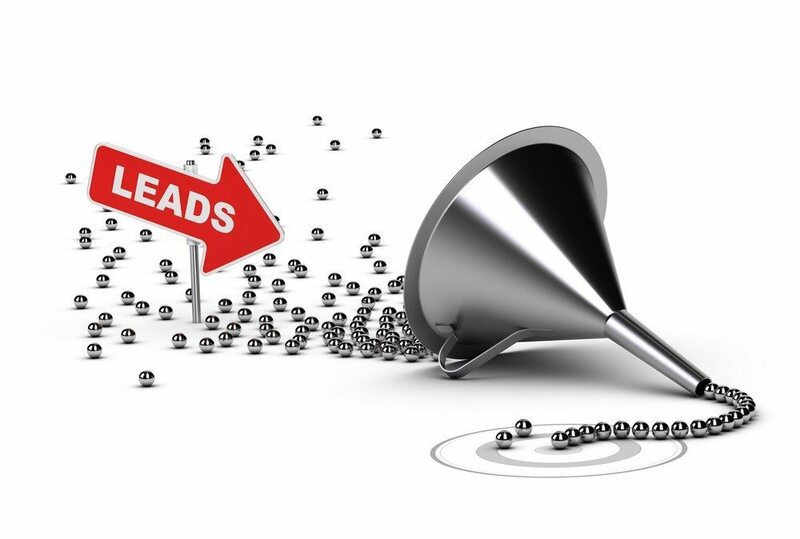 Those are all strategies that full-service brokers could employ as well to increase profit margins. 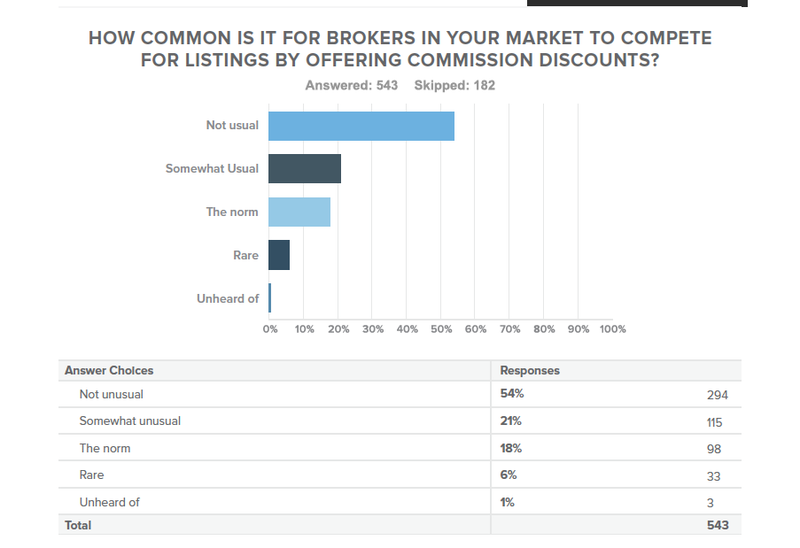 Among brokers and agents competing for listings on price, most (65) percent said they were full-service brokers or agents who make it known they are offering a commission discount. 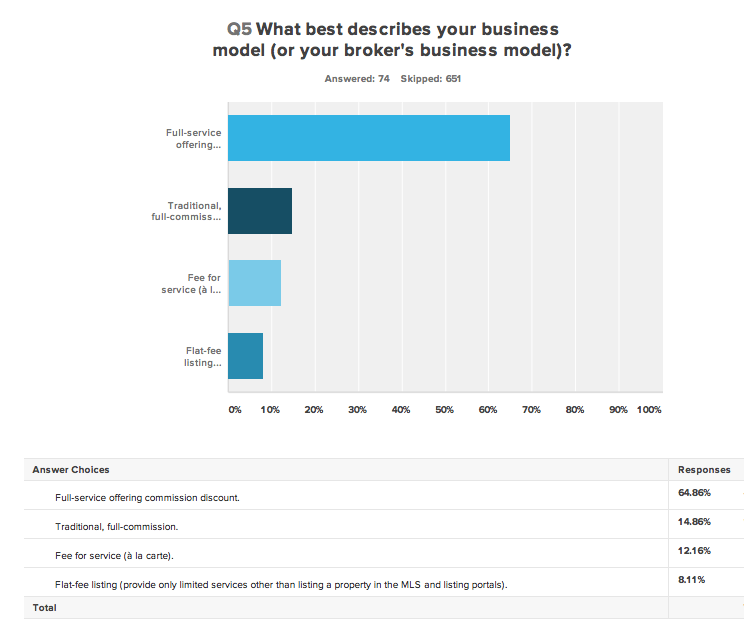 But 15 percent were traditional, full-commission brokers and agents. 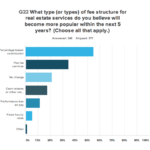 Only 12 percent of brokers and agents competing on price do so using “fee for service” (a la carte) pricing, and only 8 percent were flat-fee listing providers, who provide only limited services to sellers after listing their property in the local multiple listing service and national listing portals like Zillow, Trulia and realtor.com. 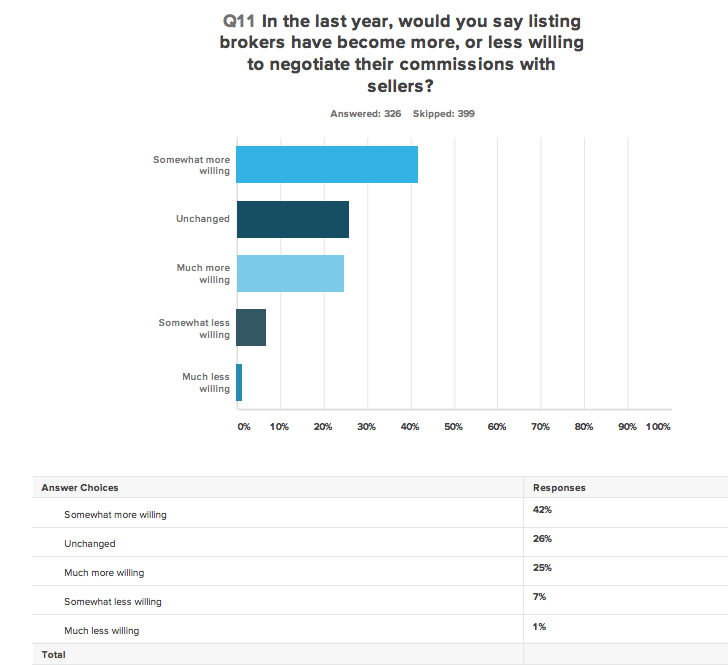 Others said that reduced commissions are often tied to keeping deals in-house, and representing both the buyer and the seller. 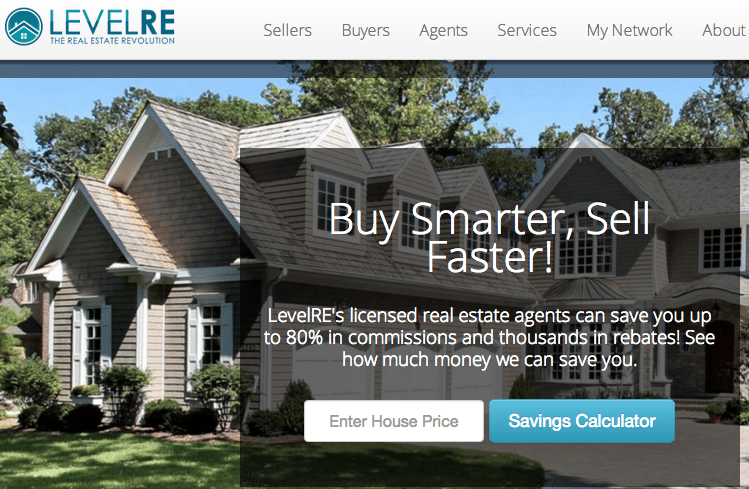 So what would motivate more brokerages to compete for listings by offering reduced commissions to sellers? 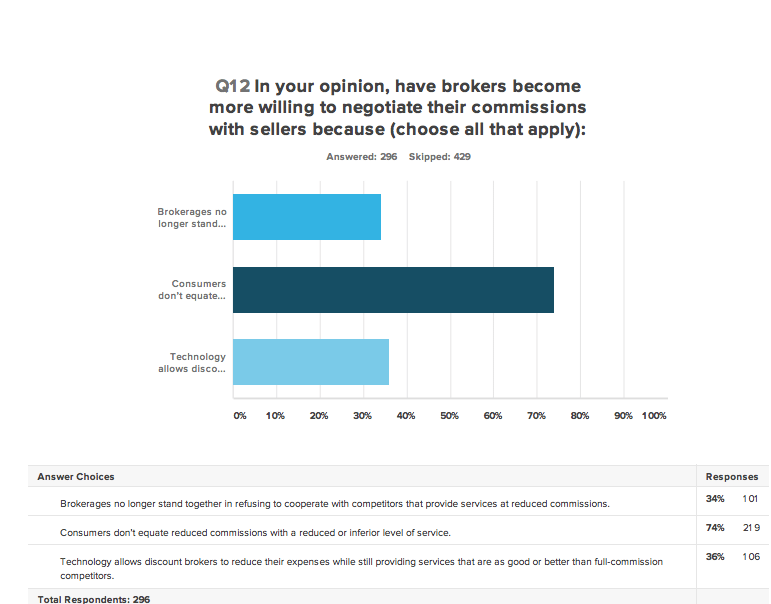 “More brokers just sucking it up and taking the risk of making the change to negotiating lower commission rates,” said another. Some think the rules of the game will have to tweaked. “Change the real estate laws so that the brokers do not have a legal fiduciary duty to their seller or buyer, which creates great liability to the broker-agent,” said one. “If we were transaction brokers, just salespeople without the legal liability,” that could make working for reduced commissions feasible. 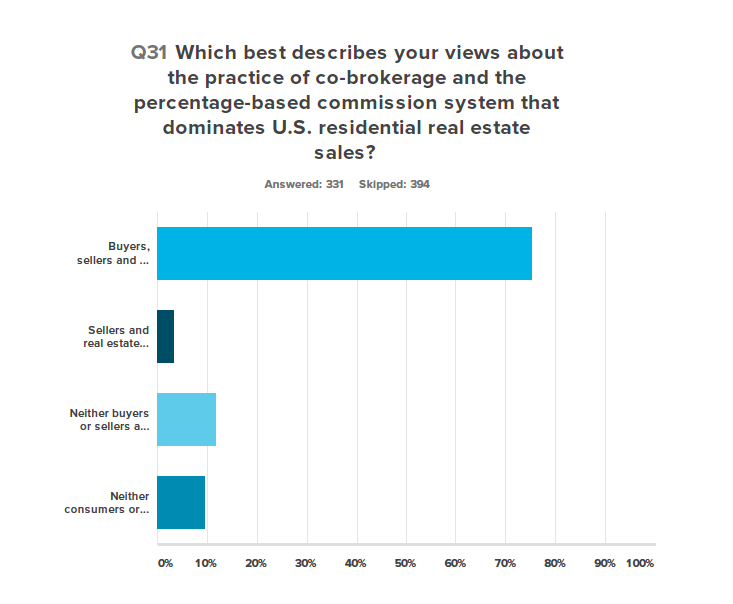 All in all, Inman readers say they think co-brokerage and the percentage-based commission system that dominates U.S. residential real estate sales works pretty well — for the industry and consumers alike. 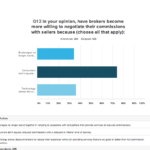 Only 12 percent said the system works well for brokers and agents but not consumers, and 10 percent said neither are well-served.